Beebe Healthcare is proud to recognize Mary Beth Palkon-Krytzer, RN, a nurse in the Cardiac Catheterization Lab, as the November Living Our Values Every Day (L.O.V.E.) Letter Award recipient. Palkon-Krytzer was nominated by Gretchen Stevens, RN, a clinical nurse in the Float Pool at the Medical Center in Lewes. Stevens recalled a time when Mary Beth went the extra mile for her patient and her team. 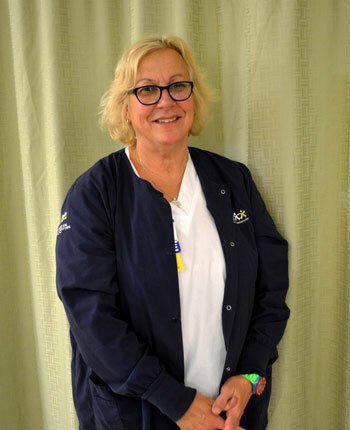 After transporting a Cath Lab patient up to an inpatient room, Mary Beth took the time to rub lotion on the patient's sore back, got her ice water, and helped the floor staff settle the patient in. Mary Beth didn't leave until she was certain the patient was comfortable and the receiving staff was well informed. “Not only was the patient extremely appreciative of Mary Beth's attentive care but so were her team members,” said Stevens. Mary Beth showcased the Beebe values of doing what it takes to keep everyone safe, doing it right the first time, treating each individual with respect and dignity, and building trusting relationships with compassion and kindness. Mary Beth has received multiple L.O.V.E. notes from her team members this year and her dedication to achieving amazing accomplishments through exceptional teamwork is highly regarded. Mary Beth acts with passion and love for others. She is truly dedicated to being an expert in her field. Thank you Mary Beth for all you do! Rick Schaffner, RN, Executive Vice President and COO of Beebe Healthcare, Catherine C. Halen, Vice President, Human Resources, and Steven D. Rhone, RN, MS, NE-BC, FABC, Vice President, Patient Care Services, were on hand to make the presentation and congratulate Mary Beth.